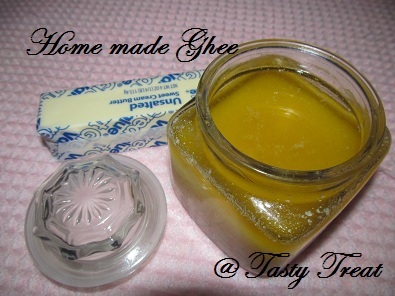 Ghee,as we all know popularly known as 'clarified butter' in English.Ghee is an important ingredient in most Indian and Asian cuisines.Ghee always has a nutty aromatic smell that drives you crazy.I always prefer adding kids foodie with a teaspoon of ghee as its rich in Vit. A.They just love that especially when you make dal curry,adding a spoon of ghee to the hot dal tastes exotic. Back in India,I used to prepare ghee from scratch, from the milk cream collected for a week.The milk once boiled and cooled,I just skim the creamy layer on top and collect it in a container and refrigerate for a week or till the container fills up.Then,whisk the cold cream in a blender or mixer till you notice the cream separating out from the butter milk.This can be rotated by a spoon and scooped out into a thick bottomed vessel and boil it to get the pure ghee.These are all lessons from my mom's kitchen which are very useful in nurturing my kids in the long run.I thought of sharing it with my blogger friends. Heat the unsalted butter in a thick bottomed kadai on low to medium heat(else you may burn up the ghee). Keep stirring in between,butter starts to melt and the bubbles start to form. After 5-6 minutes you observe the solid milk proteins starts settling down at the bottom of kadai. The solid proteins are initially white and the bubbles start reducing,lower the flame again. Add the curry leaves (strictly optional), and wait till the solid milk proteins turns brown in colour. Put off the flame,let it cool. Pour into air tight containers. 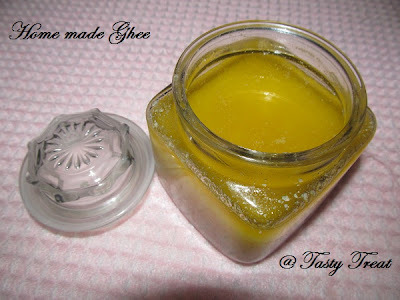 Once solidified ,it gives the nice yellow colour of ghee. 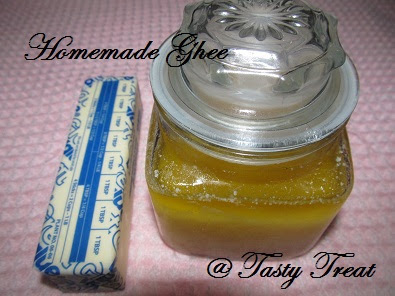 Home made ghee is ready. 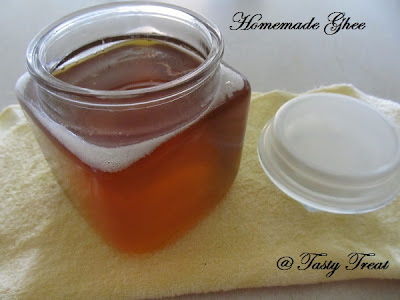 Thanks for sharing the method to prepare homemade ghee. homemade recipes are always best n good..thanx for the ghee preparation...i like your bottle looks cute :)Perfect ghee like to have with paruppu sadham...yummy.. I love the aroma of home cooked ghee. Its so different and tastes superb too..
Homemade ghee is always the best.Looks wonderful, flavourful and perfect.Lovely presentation.